Love being in front of the technologically savvy line always? Well, you might want to take into consideration the Xi3 ChromiumPC, which is touted to be the first desktop computer in the world that is powered by Google’s Chrome operating system. The PC chassis itself looks very different from what we’re used to seeing, and although it is still squarish in nature, the fact that it comes with a chrome finish makes it one of the more bling versions in the market. 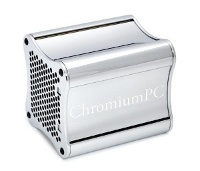 Relying on the patented Xi3 Computer Architecture, the ChromiumPC computer boasts of a tiny form factor, and comprises of a low-power (20Watts) dual-core modular computer which is highly adaptable in any environment to have it run other operating systems if you so desire, or to perform specialized functions. Individual Xi3 Modular Computers like the ChromiumPC will boast of an aluminum chassis which holds a trio of small but interconnected boards (or modules), where they are the Processor Module, the Primary I/O Module and the Secondary I/O Module. It will veer away from traditional computers since the Xi3 Computer Architecture makes it a possibility for the Xi3 Modular Computer to change its “personality”, where all it takes it a replacement of the I/O Module. Currently, the ChromiumPC will run on a dual- or single-core 64-bit, x86-based processor, where it is housed in a chassis that measures 4.0- x 3.656- x 3.656-inches, and you even have multiple colors to choose from.